The New York Historical Society is the second most important cultural institution on Central Park West after the American Museum of Natural History that is directly across from it on 77th Street. The society has some very important collections, most notably "The Course of Empire" series of large oil paintings by Thomas Cole, the founder of the Hudson River School of landscape painting, and many watercolors by James Audubon. It has a very notable collection of American paintings in its Henry R. Luce III galleries and many other important documents and works of art. 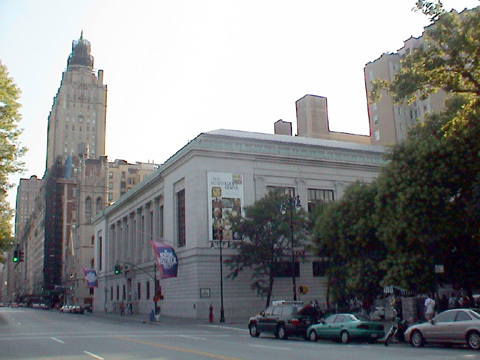 At the end of the 20th Century, however, it had its share of troubles and at one point some critics strongly suggested it should try to merge with the Museum of the City of New York, which is located on Fifth Avenue at 103rd Street, but which was at one point going to move to the Tweed County Courthouse just to the north of City Hall in Lower Manhattan. That move was canceled when Mayor Bloomberg decided that facility should be used by the city's Board of Education. "In 1860, the New-York Historical Society, founded fifty-six years earlier, constituted the city's most significant publicly accessible collection modeled along the lines of Europe's great museums, presenting a grand survey of culture through art, antiquities, manuscripts, and maps as well as through objects of historic and scientific value. Despite the sweep of its presentation, the randomness of the society's acquisition policies dramatically reflected the fact that New York had a very long way to go in terms of being a culturally important city. Until 1857 the society had occupied rooms at New York University which had been spatially adequate for an institution founded 'to collect and preserve whatever may relate to the natural, civil or ecclesiastical history of the United States in general and this state in particular.' But because New York lacked a comprehensive general museum, the society had deviated from its original mission and expanded its scope to accept much of what institutions, art dealers, and private dealers had to offer. In 1857, when its collection was enriched by the addition of 79 paintings and 250 engravings inherited from the bankrupt New York Gallery of Fine Arts, the New-York Historical Society moved into a home of its own at the southeast corner of Second Avenue and Eleventh Street. Designed by Mettam & Burke, the new two-story-and-basement, sandstone-clad Italianate building incorporated a forty-seven-foot-high dome cap in room on the second floor. The building was intended to be as fireproof as possible, with hollow walls and wrought-iron beams, among the first such measures employed in New York. A Roman Doric porch marked the main entrance facing Second Avenue. The New-York Historical Society's new home was quickly outmoded and overcrowded, however, in part because its very completion stimulated new bequests from donors, most notably thirteen large stone bas-reliefs from Nineveh that were the 1858 gift of James Lenox. In 1860, with the purchase of a 1,127-object collection of Egyptology, the society began to rethink its mission in earnest. No longer just a repository of local history, it was on its way to becoming an encyclopedic museum. Given the New-York Historical Society's evolving nature, in the early 1860s its trustees began to contemplate building a new facility that would better represent its enhanced status as New York's first 'grand museum of antiquities, science and art.' In 1862, under the authorization of the Board of Commissioners of Central Park and the state legislature, the society was permitted to take over the State Arsenal (Martin Thompson, 1851) in Central Park, facing Fifth Avenue at Sixty-fourth Street, a battlemented Gothic building built as a munitions warehouse but believed by the park's designers, Frederick Law Olmsted and Calvert Vaux, to be an ideal home for a museum. In 1865, Richard Morris Hunt was commissioned to prepare plans for the State Arsenal's transformation into a museum. Hunt boldly proposed a sweeping renovation entailing only a modest expansion, calling for the replacement of the four crenellated corner towers with mansarded pavilions and the elimination of four other towers. According to Hunt's design, the State Arsenal would have become a striped, polychromed monument suggesting the Gothic work of Eugene-Emmanuel Viollet-le-Duc in France or of George Edmund Street and William Butterfield in England. Because the size of the building was not to be significantly increased, however, the Board of Commissioners of Central Park, which was legally responsible for the building, requested that Hunt 'prepare other plans for buildings of more extensive scope and with ample requirements of this proposed great and noble undertaking.' In response Hunt created an elaborate design arranged around two courts that was quite brilliantly adapted to the tight site. Similar in its massing and details to the wing Hector Lefuel had added on to the Louvre (1854-55), a project on which Hunt had worked while in Paris, the composition was nonetheless utterly fresh and ingenious, with a cour d'honneur facing east, screened from Fifth Avenue by an arcade, and a second court, off-axis and completely surrounded by galleries. The society's building committee approved the plan in January 1866 amid high praise from the editors of the New York Times, who saw in Hunt's design the makings of 'an appropriate and beautiful edifice' that could be 'indefinitely enlarged and extended, without the least detriment to its symmetry.' But once again the Board of Commissioners of Central Park demurred on the basis of limited size, determining that the site was inadequate, and urged the New-York Historical Society to build farther uptown in the park, between the hulking Croton Reservoir and Fifth Avenue at the latitude of Eightieth and Eighty-first Streets, a site Olmsted and Vaux's Greensward design reserved for a playground but which had since been considered for a casino or a deer park. At first the society's trustees fought for the State Arsenal site but by 1868 their battle was lost and the uptown locale, equivalent in size to approximately six square blocks, was designated by the state legislature as the New-York Historical Society's new home. While it is not clear that the trustees intended to build Hunt's design uptown they did proceed with fundraising, which unfortunately did not go well. The site remained assigned to the society in April 1871, when the state legislature designated Manhattan Square on the West Side as home to both the new founded Metropolitan Museum of Art and the American Museum of Natural History. But by the spring of 1872, the New-York Historical Society was willing to admit defeat and abandon its ambitious plans so that the site could be turned over to the trustees of the Metropolitan Museum of Art, who, thought they preferred to be farther downtown, in Reservoir Square, agreed to building on upper Fifth Avenue...."
The New York Historical Society is now housed in a somber, Beaux-Arts-style structure designed by York & Sawyer in 1908 and expanded in 1938 by Walker & Gillette. The original plan and the 1938 addition were, in Byard's accurate words, resulted in "not a great building but good enough to become a designated landmark." The 1984 plan, reproduced in the book, (see The City Review article), "faced a double hurdle - to make a proper contribution to the historic district as well as to the individual landmark," he continued. "The design piled up chunks of building on the base...like a realized Byzantine painting of a hill town. Viewed straight on from the park, the elevation was straight and symmetrical over the symmetrical facade of the society....Viewed askance it was asymmetrical, as if the tower were twisting into the lower adjacent buildings even as it stood out like a post to mark its important corner in the district....The expression was adapted from decorative ideas present in the old building but developed with the strength, abstraction, and flatness of scene-painting characteristic of Hardy Holzman Pfeiffer's work. The proposal was found appropriate to the district; the animated and complex tower seemed acceptable in the context of the neighborhood and of its comparably decorated towers...but not to the old building. The central tapered tower firmly fixed the old building like the ground under a rocket. The energetic form and strongly ornamented surfaces of the tower made the new building substantially the most magnetic part of the composition. At the same time, while not mocking, the friendly, scenographic takeoff of the old building's decoration undercut its seriousness, a deflation hard for the old building to survive. Where other asymmetrical, plainer, more deferential proposals might have kept the protected building the object of the new combination, this one took command, sat on it and put it down." Ah, the old building.... It really is an unremarkable and not terribly distinguished building of no great beauty despite its "landmark" designation, but Byard's description is almost a classic example of preservationist obfuscation. Just because a building is "old," it is not necessarily an architectural masterpiece, or even a good contextual building. Furthermore, its "comparably decorated towers" presumably refer to the great Art Deco skyscraper masterpieces nearby on Central Park West, the San Remo two blocks to the south, and the Beresford, four blocks to the north. This tower obviously, and properly, was designed with them very much in mind and it would have been a spectacular and wonderful addition to Central Park West's fabled skyline. To suggest that it would have "sat on it and put it down," which is to say embarrassed it is right, but it, more importantly, it would have made it better by taking the focus off its blandness and enriching it. The denial of a certificate of appropriateness perhaps had more to do with politicians deciding to not block the vistas of a handful of residents in the sidestreet building behind the proposed tower. The society was then and still is in financial difficulties and the proposed tower would have helped ease them substantially, yet another reason why this case is so difficult to understand. Hopefully, the institution will at some point revive the Hardy Holzman Pfeiffer scheme. In the fall of 2006, the museum did revive plans for an addition and commissioned Mr. Byard to design the renovation of the existing building and to make a master plan for the addition, which it planned to ask developers have designed by a "star" architect. An article in The New York Times showed a rendering prepared by Mr. Byard that showed a glass tower of about 20 stories rising above the south end of the museum's building, which would have a glass-clad floor added to it. The new proposal, however, was much worse than the Hardy Holzman Pfeiffer scheme as it clashed significantly with the base and showed no respect to the great masonry skyline of Central Park West. Interestingly, the proposal became public just a few days after Aby Rosen revealed plans by Lord Norman Foster for a 22-story addition with condominium apartments to the Carlyle Galleries building at 980 Madison Avenue across from the Hotel Carlyle. That plan offset the proposed tower to the north of the building to minimize the impact on important vistas from the Hotel Carlyle, which is offset to the south on its blockfront. Mr. Byard is one of the city's most intelligent and sensitive architects, especially in the area of historic preservation and it is surprising that he failed to recognize how bad the society's existing building is and what a great opportunity it provides to carry on the great skyline tradition of Central Park West. How dare neighbors complain that their views may be blocked. This is New York City and the public's right to enjoy great architecture is more important than the visual interests of a few individuals! The New York Historical Society decided in July, 2008 not to build a tower over its facility that occupies the Central Park West blockfront between 76th and 77th Streets. It had been planning to erect a 23-story building that would be partially cantilevered over its existing, a somber, Beaux-Arts-style building. The planned tower would provide about 75,000 square feet of expansion space on five floors for the institution and 18 floors of residential condominium apartments and it would have risen on an empty lot it owns at 7-13 West 76th Street just to the west of its limestone-clad building whose original center section was designed in neo-classical style in 1904 by York & Sawyer and expanded with wings at the north and south in 1937 by Walker & Gillette. The tower plan, designed by Platt, Byard, Dovell & White, however, met with considerable opposition from some civic groups and preservationists. The plan would have doubled its gallery space, added an elevator and improved circulation. The Landmarks Preservation Commission approved proposed changes to the existing building's façade last year but that application was not about a new tower. In 1984, the commission voted against a plan by the society to erect a tower over its existing building that had been designed by Hardy Holzman Pfeiffer. That very handsome design would have created an excellent transition between the San Remo and the Beresford apartment towers on the Central Park West skyline, landmarks designed by Emery Roth. The Hardy Holzman Pfeiffer design would have recalled Emery Roth's great design for the Ritz Tower on the northeast corner of Park Avenue and 57th Street although it would have been lower and a bit squatter. In his excellent book, "The Architecture of Additions, Design and Regulation," (W.W. Norton & Company, 1999), Paul Spencer Byard, a partner with Platt, Bayard, Dovell & White, recounted the 1984 plans and noted that the proposed "central tapered tower firmly fixed the old building like the ground under a rocket," adding that "The energetic form and strongly ornamented surfaces of the tower made the new building substantially the most magnetic part of the composition." An article in The New York Times by Glenn Collins said that the society now plans a $55 million renovation that will take three years and create a ground floor cafe on 77th Street and a children's gallery in the cafe's former space in the basement. The article quoted Louise Mirrer, the society's president, as stating that "we respect our neighbors and our community and we like to get along with them," adding the decision not to proceed with a major expansion was not related to economics and community criticism. The renovation, she continued, "will make the society more accessible, more welcoming and more compelling." "Dr. Mirrer said the interior construction plans would not violate restrictions imposed by the city and the state, which have contributed more than $25 million for prior improvements inside the building since the early 1990s, when the neglected and nearly bankrupt society closed its doors for two years," the article continued.